Whaling brought most species to the brink of extinction before the International Whaling Commission started rules in 1946. By 1986 members imposed a moratorium on all commerical fishing. That hasn't stopped Japan, Norway and Iceland and from continuing to hunt commercially under the guise of scientific research. Other countries allow indigenous communities to hunt for sustenance. Although whale meat prices have been plummeting, the governments of whaling nations spend millions on whaling welfare to prop up the industries and try to overturn the ban at , The pro-whaling World Council of Whalers maps the tens of thousands of whales taken each year. Whales can become entangled in fish lines or crash into ships. Sonar and exlposions from gas and oil exploration have lead to mass strandings of many types of marine mammals. Gray Whales, which are now extinct in the Atlantic, are still endangered in the Pacific, but 18,000 now migrate along the coast. Killer Whales of the Pacific northwest are dwindling. They are still captured off Russia. What you would normally consider to be environmentally unfriendly--going out in a huge boat or helicopter--may actually be better for the whales. The bigger the boat, the fewer boats out there to bother whales. Ask how often they see whales this time of year. Whale boats tend to be small and manueverable. That means they may bounce around and make you seasick. Consider getting a motion sickness patch from your doctor, such as TransDerm Scop. Remember that it's colder and wetter out on the boat. Dolphin Fleet Whalewatch recommended for its sensitive treatment of whales. Boston Harbor Cruises big, comfortable catamaran. The New England Aquarium says whale sightings have been up in recent years. Boats visit Jeffrey's Ledge or Stellwagen Bank, depending on where the whales are. Yankee Fleet started with fishing boats in 1944. Has an annual all day whale-watching excursion for tje Center for Oceanic Research & Education. Offer a 3-day tour way out to Georges Bank and Gilberts Canyon. Bar Harbor has the most tours in Boats sail 20 miles out into the Gulf of Maine, where humpback, finback and Minke whales live (along with dolphins, seals and seasonal puffins). Odyssey Whale Watch has a 5-hour summer cruises that goes all the way to Jeffery's Ledge and the Sagadahoc Grounds. Bath: Cap'n Fish In June and July they go see Puffins at Eastern Egg Rock. New Hampshire only has 16 miles of coastline, but touristy Rye, has 2 fleets that visit Jeffrey's Ledge and the Stellwagen Bank Marine Sanctuary. Both tour companies are recommended by the Blue Ocean Society. offers overnight cruises to see whales and pelagic birds in the Great South Channel. Cape May, at the southern tip of New Jersey, has several tour operators who take you out to the open water to see whales and bottlenose dolphins. Some have a "marine mammal" guarantee--so you'll at least see a dolphin. Wildwood, the amusement park barrier island, has NJ's most whale watching tours. They also provide a list of charter planes and boats. Cape Meares State Scenic Viewpoint which also has a colony of murres and many bald eagles. When gray whales migrate up and down the coast, you can even see them from the air. Tillamook Air Tours takes you up in a restored 1942 Stinson Reliants. Orcas Island Eclipse Charters has a biodiesel boat that may pass Spieden Island, home to European Fallow Deer, Sitka Deer and Moufalon sheep, which were introduced and now protected. Port Townsend PS Express Bellingham Island Mariner Their naturalists can id which pods the killer whales belong to. Right out of San Francisco, you can vist marine sanctuaries: Cordell Bank, the Farallon Islands, which has harbor seals, elephant seals, harbor porpoises, Pacific white-sided dolphins, rockfish, and the Tufted Puffin.You'll pass lighthouses, and possibly see blue or gray whales and sharks who come to eat seals and sea lions. It's the biggest seabird breeding colony in US--more than 400,000. Boats from Newport Landing go out all year. May to Nov., you may see blue, killer or finback whales, seals, or thousands of dolphins. Dec. - April gray whale migrate through. Some trips go by the Catalina Islands. A prime watching area is the Channel Islands National Marine Sanctuary, which keeps track of marine mammals seen. Up to 10,000 giant, endangered humpback whales winter around Hawaii. 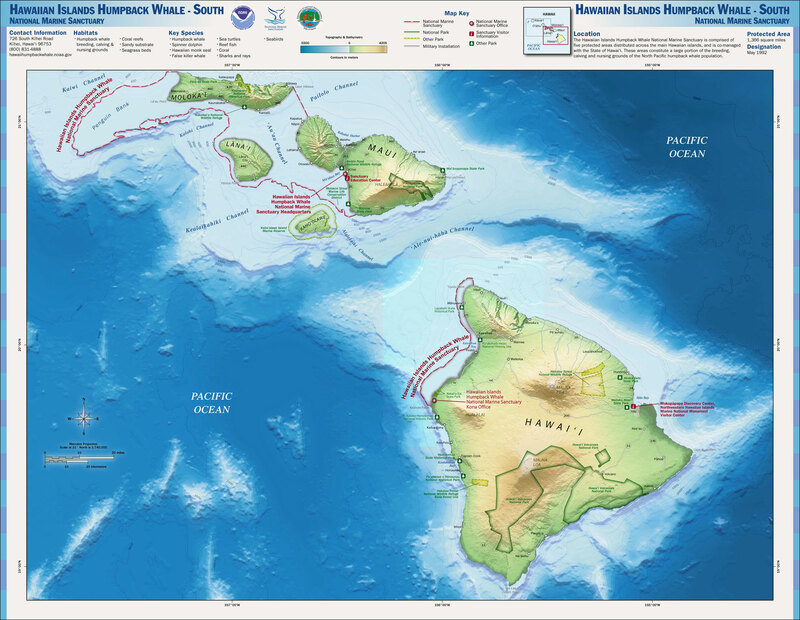 NOAA's Hawaiin Island Humpback Whale National Sanctuary lists plenty of places where you can see whales from shore. The reserve is not contiguous--as you can see from its map. The $20 million Hawaiin whale-watching industry has boats going out all over the islands, too. On the the last Saturday of January, February and March volunteers help count the whales from the islands of O`ahu, Kaua`i and Hawai`i. Atlantis Adventures runs submarine cruises out of Waikiki, Maui and Kona. They have all kinds of permutations on the cruises on all kinds of submarines, including a whale lunch cruise in season. They range from 35 minutes to several hours, with some including elaborate meals or an extra charge for a good view. Up to $150 in 2009. The Pacific Whale Foundation has nine different, reasonably priced whale tours from both the Ma'alaea and Lahaina Harbors depending on the season. The group also offers dolphin tours, including all-day snorkeling, off Lana'i and Maui. Off Oahu you can snorkel with dolphins and turtles all year or go out in a boat to see whales in the winter. Under the Sea offers really small tours with six or fewer people and a crew that's usually all women. Huge, endangered humpback whales winter around Hawaii from December to April. Locals brag it's the only place in the country where whales breed and calve. In the winter you can see humpbacks. Other times you may see spinner dolphins, bottlenose dolphins, pilot whales, black whales, manta rays, sharks or sea turtles. Many whale-watching boats paired with cruise ships take off from Juneau's Auke Bay in search of humpback whales and orcas. You may also see bald eagles, seals, sea lion, dall's porpoise and the harbor porpoise. Allen Marine Tours offers boats in Juneau, Ketchikan and Sitka, working with the big cruise lines. They sometimes see bear and say they've always seen whales for 10 years. Anchorage is right in the middle of several great ports that go out to look for humpback, killer and gray whales. Along the way, animal tourists may see bald eagles, seals, porpoises and puffins. The tours leave from different cities (Seward, Valdez, Whittier) and scope out various bodies of water (Prince William Sound, Resurrection Bay, Kenai Fjords National Park) but they usually have convenient transportation from Anchorage. And they're are all looking for the same animals from May to Sept. The exception are the gray whales, which can only be found in April and May. Prince William Sound Glacier Cruises Seek otter and bear and have overnight glacier trips. Renown Tours gray whales in early summer. Where else can you see whales migrating hundreds of miles inland? 13 whale species (including the blue whale) and seals migrate through where the St. Lawrence meets the Saguenay Fjord. You can sometimes see whales from there shore, but there are plenty of whale watching cruises in this Quebec park. Whales visit the St. Lawrence Seaway from June to September. Their favorite spot seems to be the mouth of the Saugenay Fjord. Labrador and Newfoundland have compiled a list of sites to see whales either from the shore or by boat. The MV Iceberg Alley sees humpback, minke and finback whales, dolpins, seals, terns, black quillenot, kittewakes, seagulls, puffins, murres, and shearwaters. Lunenberg Whale Watching goes out several times a day and says you get so close you could touch the whales. Best time is summer. From May to October boats go out of Port McNeil to look for orca. You may also see minke whales, humpback whales, Pacific white-sided dolphins, Dall’s porpoises, harbour seals, Steller sea lions, and nesting eagles. Tofino, a tiny former fishing town, is a base to see killer, gray and humpback whales, bears, huge storms and the Clayoquot Sound, a United Nations World Biosphere Reserve. Ocean Outfitters has both bear and whale viewing. Jamie's Whaling Station tours Wouwer Island in Barkley Sound, where 2,500 California and Stellar Sea Lions visit in August and September. You can support Ranulfo Mayoral, the first fisherman to realize the local whales were friendly and wanted to say hi, by using Pachio's Eco Tours. The hard part is getting here; San Ignacio is 170 miles from Loreto (LTO) airport. Ssee gray and humpback whales and sea lions and their pups. The Silver Bank in the Dominican Republic has been a sanctuary for breeding humpbacks since 1986. WhaleRoute says the whales can be seen in winter and spring around Silver Bank, Navidad bank and Samana Bay in DR and Mona Passage, Puerto Rico; Virgin Bank and Anguilla Bank. The sanctuary has rules, but lets people get in the water with humpbacks. Conscious Breathe Adventures describes this as Soft-in-Water experiences where you let the whales approach you. Wales Off of Wales, St. David's and Ramsey Island offers a chance to see dolphins and killer whales.You actually depart from Justinian, then head out to the Irish Sea. Along you'll see porpoise almost all the time, dolphins 95% and whales 30%, according to Offshore Islands Voyager. Húsavík, Iceland, considers itself the whale capitol of Europe. The Húsavík Whale Museum is, predictably, pro-whaling. Reykjavík, Iceland, has so many whale watching boats you can pretty much turn up in the harbor to find one. They have 95% success. Some are fishermen when they aren't taking you out. Many are tiny boats, so be prepared for sea sickness. Tour companies: Elding - Reykjavík Whale Watching, Life of Whales, Eskimos, Iceland Travel, Iceland Excursions - Gray Line Iceland, Touris, Iceland on Track ehf. You can see killer whales from the land in Tysfjord, Norway, according to the Complete Whale-Watching Handbook. The orcas are here for the herring, which some have noticed is declining in recent years. The tours, which go out in winter and even offer snorkeling, are expensive, nearly $200. A biologist leads an educational trip through Responsible Travel to study sperm whales and the giant squid they eat in the Ionian Sea. Sperm whales are the big attraction in the Azores. Boats leave from São Miguel and other islands. Hermanus, South Africa, has a whale festival every September. You can see right whales here from June to November from the shore on a scenic cliff-top walk. Or plenty of guides offer boat tours. The island of Shikoku has whale cruises from many of its fishing ports. Kerama Islands Humpback whales breed around the Kerama islands in early spring. You may see them from shore on Tokashiki-jima or Zamami-jima Islands. Zamami has plenty of tour boats, too. Ogasawara Islands You can only get to the Ogasawara Islands by taking a 25-hour ferry from Tokyo. But once you get here, you have a 90% chance of seeing humpback whales. From February to April, you can see humpbacks from land. Sperm whales are seen in summer and fall. Dolphin swims year-round. Sri Lanka may be the best place in the world to see blue and sperm whales. Wildlife Extra claims it's the calm seas that make it so easy to see the giant whales so close to shore. Bonus Species: Hectors and dusky dolphin, New Zealand fur seals and the Royal Albatross. Tongans let you swim with the 450 giant humpback whales that visit its islands each year. Whether this is a good idea for your or the whales is another question. Various tours offer sailing, kayaking, snorkeling with whales. Got a hot whale spot? We'd love to hear about it. Please email us. An Easier Way to Find a Whale-Friendly Whale Watch on the East Coast? Engand celebrates Whale Week. Could we have one worldwide?